CyberTouch is a tactile feedback option for VTI's popular 18-sensor CyberGlove instrumented glove. CyberTouch was named the 1996 Virtual Reality Product of the Year in the hardware category by CyberEdge Journal. CyberTouch features small vibrotactile stimulators on each finger and the palm of the CyberGlove. Each stimulator can be individually programmed to vary the strength of touch sensation. The array of stimulators can generate simple sensations such as pulses or sustained vibration, and they can be used in combination to produce complex tactile feedback patterns. 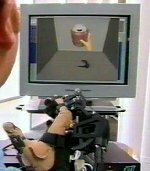 Software developers can design their own actuation profile to achieve the desired tactile sensation, including the perception of touching a solid object in a simulated virtual world. The CyberTouch tactile feedback option is essential to anyone serious about using their hands to interact with objects in a virtual world. Finally, there is a product that lets you feel a virtual object and know it is in your hand without having to look. Six (one on each finger, one on the palm). 1.2 N peak-to-peak @ 125 Hz (max). 10.00" x 6.25" x 2.75"; 30 oz.